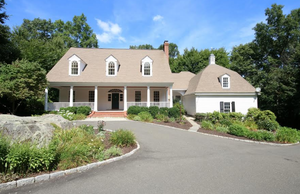 Exceptional Fossi built custom colonial set back privately at the end of a cul de sac in sought after Farmingville neighborhood on 2.09 tranquil acres with heated free from pool. Impressive from first glance with Belgian block circular drive, cobblestone apron, perennial gardens, and charming covered Mahogany front porch w/timbered bead board ceiling. Dramatic two story foyer and classic center hall layout featuring elegant living room with marble fireplace; formal dining room with Mahogany inlaid hardwood floor and angled bay window; plus French doors from both rooms to the dramatic open great room showcasing the sparkling white chef's kitchen with center island, gas range top and double ovens; wide open to the inviting family room offering rustic field-stone fireplace and stunning wall of windows/French doors overlooking the adjoining deck and pool entertaining areas. The sprawling main level also features an impressive master bedroom suite with vaulted ceiling, walk-in closet, and a spacious private bath with jetted tub snd separate frame-less shower. The convenient back hallway leads to the laundry room and rear staircase to the spacious bonus room, ideal as an office, library, or hang out. The second floor offers 3 additional bedrooms, all with hardwood floors, one ensuite, and two with Jack & Jill bath. Total 4,991 finished square feet on three levels including 800 sf in the walk-out lower level with game room, den, or fitness rooms plus additional unfinished storage. Attached 3 car garage plus workshop and most convenient location to trains, shopping, and all commuting routes. To learn more about this home, contact Laura Freed Ancona here.